Theoretical arguments and empirical evidence suggest that a more diverse teacher workforce can help improve outcomes for students of color. Nearly two decades ago, then Secretary of Education Richard Riley (1998) said that “Our teachers should look like America.” His words reflect a long-standing concern about the mismatch between the demographics of the teacher workforce and the nation’s students. Indeed, improving the recruitment and retention of teachers of color has long been a policy goal, particularly in districts with large percentages of students of color (Kirby et al., 1999). Despite this rhetoric, we have made relatively little progress toward ensuring that the diversity of the teaching workforce reflects the diversity of the student body in U.S. public schools (Albert Shanker Institute, 2015). In fact, by some measures, we seem to be moving backward. Between 2003 and 2012, for example, the percentage of the nation’s teachers who are Black dropped by more than a point, while over the same time span, the increase in the percentage of Latinx students far outpaced the modest increase in the percentage of Latinx teachers (Snyder, 2014). Should school districts and teacher education programs seek explicitly to recruit teachers of color? The answer to this question depends in part on one’s view of the importance of providing employment opportunities to traditionally underrepresented groups and how this relates to efforts to create a culturally diverse and culturally sensitive teacher labor force. It also depends on whether teachers of color are more effective in educating certain students. A significant body of literature argues that a match between the race and ethnicity of teachers and students leads to better student outcomes, particularly in high-poverty environments with significant at-risk student populations (e.g., Ogbu, 1992). At least three commonly cited theoretical rationales suggest why racially matched teacher role models have positive educational benefits for students of color in particular. The first is that students of color, particularly those living and attending schools in disadvantaged settings, benefit from seeing role models of their race in a position of authority (Villegas & Lucas, 2004). In particular, some scholars have suggested that having an adult role model who exemplifies academic success could alleviate the stigma of “acting White” among some students of color (Fordham & Ogbu, 1986). Second, some researchers argue that teachers of color are more likely to have high expectations for students of color (Ferguson, 2003). This is important because students of color, especially Black students, appear to be more sensitive to teacher expectations than middle-class White students (McKown & Weinstein, 2002). And when teachers allow negative stereotypes to lower expectations, a “self-fulfilling prophecy” takes hold to perpetuate poor performance of students of color (Brophy, 1983; Steele & Aronson, 1995). 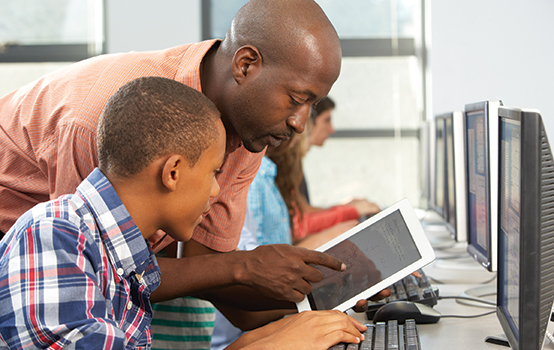 For a low-income Black male student in grades 3 through 5, being taught by at least one Black teacher reduces the probability of dropping out by 39%. Finally, some argue that teachers of different backgrounds are able to draw on their own cultural contexts when determining instructional strategies and interpreting students’ behavior. A vast literature finds that Black students are more likely to be disciplined and suspended from school than other students, even after accounting for the nature of students’ misconduct (e.g., Skiba et al., 2002). These disparities in disciplinary actions could be based in part on teacher interpretation of student behavior, which may be informed by negative stereotypes (Gregory et al., 2010). These theoretical arguments suggest several ways that increasing the diversity of the teacher workforce might improve outcomes for students of color. When empirical researchers have considered the effects of teacher diversity, they have generally found that, all else being equal (and, importantly, all else is often not equal), students of color do appear to benefit when they are taught by a teacher of the same race or ethnicity. Much of this empirical evidence focuses on student test performance, but we also discuss empirical evidence related to other important outcomes such as subjective evaluations and discipline. Researchers over the past two decades have increasingly gained access to longitudinal data containing annual student test scores linked to individual teachers, which has led to an explosion of research into predictors of student test performance. 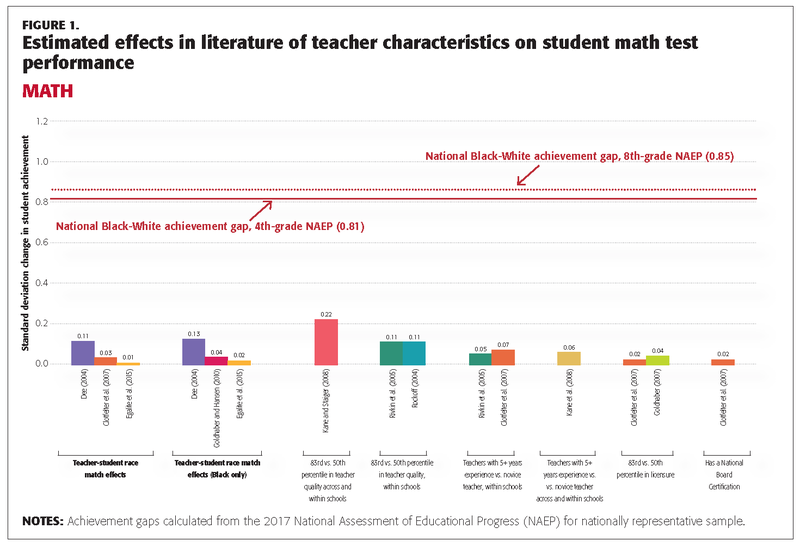 This evidence generally suggests that having a teacher of the same race has a small but meaningful impact on student test scores. In a seminal study, Thomas Dee (2004) analyzed data from Tennessee’s Project STAR class-size experiment (in which students were randomly assigned to teachers) and found that students taught by a teacher of the same race scored 0.11 standard deviations higher in mathematics and 0.06 standard deviations higher in reading than similar students of the same grade, entry wave, and school who were assigned to a teacher of different race. These effects were largest when Black students were assigned to a Black teacher. Dee’s findings have been corroborated by several more recent studies that used even more extensive statewide administrative databases of students and teachers, although the magnitudes of the findings tended to be more modest. Using longitudinal data from North Carolina, Charles Clotfelter and colleagues (2007) found that students scored 0.03 standard deviations higher in mathematics and 0.02 standard deviations higher in reading when they were assigned to a teacher of the same race than they did when assigned to a teacher of a different race. When Dan Goldhaber and Michael Hansen (2010) used the same data set, they found even larger effects for Black students; specifically, Black students with a Black teacher scored 0.04 standard deviations higher in both reading and mathematics than Black students with a White teacher, all else being equal. Most recently, Anna Egalite and colleagues (2015) observed a 0.02 standard deviation greater gain in mathematics test scores and a 0.004 standard deviation greater gain in reading test scores for Black students matched to Black teachers in Florida classrooms relative to Black students with a White teacher, all else being equal. Although the empirical evidence discussed to this point concerns student test performance, additional evidence illustrates the importance of teacher role models for non-test outcomes, such as subjective evaluations, discipline, and the probability of high school dropout. For example, Ronald Ehrenberg and colleagues (1995) found that teachers are more likely to give better subjective evaluation of future success and behavior for students of the same race. With the same data, Thomas Dee (2005) found that having a teacher of a different race increased the odds that the student was viewed as disruptive by 46%, inattentive by 34%, and rarely completing assignments by 28%. These non-test-related role-modeling effects are potentially quite important as subjective assessments by teachers could influence the extent to which teachers encourage students and the recommendations they might write for colleges. Additionally, disciplinary actions have been widely linked to decreases in future student achievement and future delinquency (Arcia, 2006; Gregory & Ripski, 2008), suggesting that the discipline gap contributes significantly to the achievement gap (Gregory et al., 2010). Moreover, recent research shows how these differences influence the outcomes of students of color. For example, Constance Lindsay and Cassandra Hart (2017) found that Black students taught exclusively by Black teachers were 2 to 3 percentage points less likely to receive exclusionary discipline than if they encountered only non-Black teachers. Seth Gershenson and colleagues (2016) found that non-Black teachers had significantly lower expectations of educational attainment for Black students than Black teachers. And, most recently, Gershenson and colleagues (2017) found that, for a low-income Black male student in grades 3 through 5, being taught by at least one Black teacher reduces the probability of dropping out by 39% and increases the student’s intent to pursue a four-year university degree by 29%. Although the findings we describe above are encouraging and suggest an empirical basis for teacher workforce diversification, it is important to have clarity about the magnitudes of the estimated effects. Figure 1 (mathematics) and Figure 2 (reading) show how these estimated role-modeling effects stack up against both the overall achievement gaps between Black and White students and the estimated effects of other teacher characteristics on student achievement. In 2017, the national Black-White achievement gap in math was 0.81 standard deviations in 4th grade and 0.85 standard deviations in 8th grade. These achievement gaps were somewhat smaller in reading (0.68 for 4th grade and 0.72 for 8th grade). 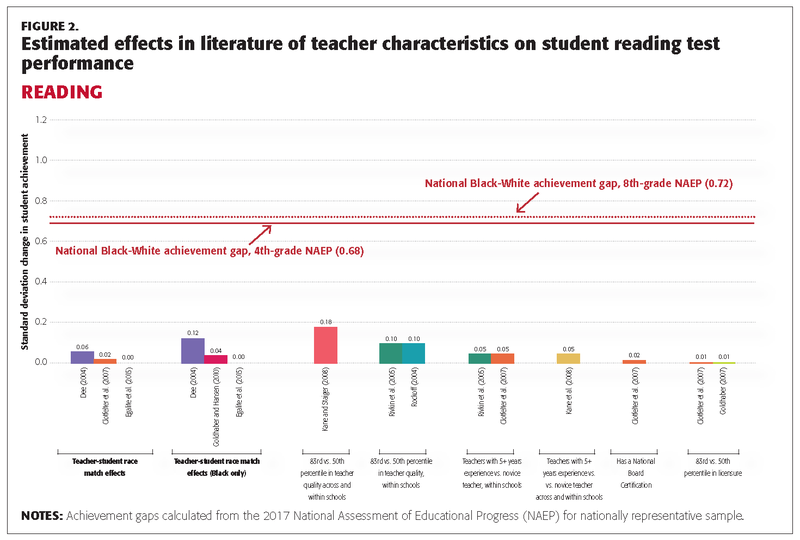 When looking at the first two sets of bars in each figure, which represent the estimated role-model effects, we can see that these effects alone will not close Black-White achievement gaps in public schools. Yet, while diversification of the workforce is unlikely to affect achievement gaps radically, we believe the magnitudes of these effects to be educationally meaningful, especially when compared to many other teacher characteristics. For example, while it is well established in the literature that teachers with higher credential test scores and teachers who have National Board certification are more effective than other teachers, all else being equal, the estimated effects of each of these credentials tend to be smaller than the estimated role-model effects discussed above. Put another way, assigning a Black student to a Black teacher is associated with higher learning gains than assigning the same student to a teacher with one standard deviation higher credential test scores or a teacher who is National Board certified. Moreover, the largest estimates from the literature on role-model effects (Dee, 2004) are surprisingly comparable to the effects associated with having more than five years of teaching experience and a higher level of teacher quality. That said, other estimates of role-model effects (Clotfelter et al., 2007; Egalite et al., 2015; Goldhaber & Hansen, 2010) are considerably more modest, with one paper showing the role-model effect having less than half the reported returns of having a teacher with five or more years of experience (Clotfelter et al., 2007). Nonetheless, given how well the role-model effect stacks up against the other teacher credentials summarized in Figures 1 and 2, it is clear that having a diverse teaching force is educationally meaningful for students of color. The theoretical arguments and empirical evidence generally support the notion that improving the diversity of the teacher workforce would help close racial achievement gaps in public schools. However, teacher workforce diversity is just one of many ways to improve the education system, and diversifying the teacher workforce may present substantial challenges and potential unintended consequences. One challenge is that we know very little about what contributes to the lack of diversity in the teaching workforce. We must understand the answer to that question before we can design effective strategies to recruit more teachers of color. Another challenge is that, while the empirical evidence is consistent with the three theoretical arguments about the importance of teacher workforce diversity discussed above, we don’t have conclusive evidence for why students of color appear to benefit from assignment to a teacher of the same race. Policy makers must also be aware that there may be unintended consequences to diversifying the teacher workforce. One concern is that newly recruited teachers of color (perhaps recruited through policies intended to improve diversity) may not be as effective as teachers of color currently in the workforce (Egalite et al., 2015). Suppose, for example, that a state — acting on evidence that candidates of color are disproportionately affected by teacher licensure test requirements (Goldhaber & Hansen, 2010) — decided to reduce or remove these barriers. This may improve the diversity of the state’s teaching workforce, but there is also compelling evidence (e.g., Clotfelter et al., 2010; Goldhaber, 2007; Goldhaber & Hansen, 2010) that teachers with higher credential test scores are more effective. Thus, it is unclear what the overall effect of such a policy would be. That said, these are just caveats to the overall conclusion that there are good reasons to believe that students of color would benefit from a more diverse teaching workforce. Thus, policy makers should consider policies to increase the diversity of the teacher workforce as one of many strategies to attempt to close racial and ethnic achievement gaps in public schools. Albert Shanker Institute. (2015). The state of teacher diversity in American education. Washington, DC: Author. www.shankerinstitute.org/resource/teacherdiversity. Arcia, E. (2006). Achievement and enrollment status of suspended students: Outcomes in a large, multicultural school district. Education and Urban Society, 38 (3), 359-369. Brophy, J.E. (1983). Research on the self-fulfilling prophecy and teacher expectations. Journal of Educational Psychology, 75 (5), 631. Clotfelter, C.T., Ladd, H.F., & Vigdor, J.L. (2007). Teacher credentials and student achievement: Longitudinal analysis with student fixed effects. Economics of Education Review, 26 (6), 673-682. Clotfelter, C.T., Ladd, H.F., & Vigdor, J.L. (2010). Teacher credentials and student achievement in high school: A cross-subject analysis with student fixed effects. Journal of Human Resources, 45 (3), 655-681. Dee, T.S. (2004). Teachers, race, and student achievement in a randomized experiment. Review of Economics and Statistics, 86 (1), 195-210. Dee, T.S. (2005). A teacher like me: Does race, ethnicity, or gender matter? American Economic Review, 158-165. Egalite, A.J., Kisida, B., & Winters, M.A. (2015). Representation in the classroom: The effect of own-race teachers on student achievement. Economics of Education Review, 45, 44-52. Ehrenberg, R.G., Goldhaber, D., & Brewer, D.J. (1995). Do teachers’ race, gender, and ethnicity matter? Evidence from the National Educational Longitudinal Study of 1988. Industrial and Labor Relations Review, 48 (3), 547-561. Ferguson, R.F. (2003). Teachers’ perceptions and expectations and the Black-White test score gap. Urban Education, 38 (4), 460-507. Fordham, S. & Ogbu, J.U. (1986). Black students’ school success: Coping with the “burden of ‘acting White.’” The Urban Review, 18 (3), 176-206. Gershenson, S., Holt, S.B., & Papageorge, N.W. (2016). Who believes in me? The effect of student–teacher demographic match on teacher expectations. Economics of Education Review, 52, 209-224. Gershenson, S., Hart, C.M.D., Lindsay, C.A., Papageorge, N.W. (2017). The long-run impacts of same-race teachers (IZA Discussion Papers, No. 10630). Bonn: Institute of Labor Economics (IZA). Goldhaber, D. (2007). Everyone’s doing it, but what does teacher testing tell us about teacher effectiveness? Journal of Human Resources, 42 (4), 765-794. Goldhaber, D. & Hansen, M. (2010). Race, gender, and teacher testing: How informative a tool is teacher licensure testing? American Educational Research Journal, 47 (1), 218-251. Gregory, A. & Ripski, M. B. (2008). Adolescent trust in teachers: Implications for behavior in the high school classroom. School Psychology Review, 37 (3), 337. Gregory, A., Skiba, R.J., & Noguera, P.A. (2010). The achievement gap and the discipline gap: Two sides of the same coin? Educational Researcher, 39 (1), 59–68. Kane, T.J., Rockoff, J.E., & Staiger, D.O. (2008). What does certification tell us about teacher effectiveness? Evidence from New York City. Economics of Education Review, 27 (6), 615-631. Kane, T.J., & Staiger, D.O. (2008). Estimating teacher impacts on student achievement: An experimental evaluation (No. w14607). Cambridge, MA: National Bureau of Economic Research. Kirby, S.N., Berands, M., & Naftel, S. (1999). Supply and demand of minority teachers in Texas: Problems and prospects. Educational Evaluation and Policy Analysis, 11 (3), 301-323. Lindsay, C.A. & Hart, C.M. (2017). Exposure to same-race teachers and student disciplinary outcomes for black students in North Carolina. Educational Evaluation and Policy Analysis, 39 (3), 485-510. McKown, C. & Weinstein, R.S. (2002). Modeling the role of child ethnicity and gender in children’s differential response to teacher expectations. Journal of Applied Social Psychology, 32 (1), 159-184. Ogbu, J.U. (1992). Understanding cultural diversity and learning. Educational Researcher, 21 (8), 5-14. Riley, R.W. (1998). Our teachers should be excellent, and they should look like America. Education and Urban Society, 31 (1), 18-29. Rivkin, S.G., Hanushek, E.A., & Kain, J.F. (2005). Teachers, schools, and academic achievement. Econometrica, 73 (2), 417-458. Rockoff, J.E. (2004). The impact of individual teachers on student achievement: Evidence from panel data. American Economic Review, 94 (2), 247-252. Skiba, R.J., Michael, R.S., Nardo, A.C., & Peterson, R.L. (2002). The color of discipline: Sources of racial and gender disproportionality in school punishment. The Urban Review, 34 (4), 317-342. Snyder, T.D. (2014). Digest of Education Statistics, 2013 (NCES 2014-086). Washington, DC: U.S. Department of Education, National Center for Education Statistics. Steele, C.M. & Aronson, J. (1995). Stereotype threat and the intellectual test performance of African Americans. Journal of Personality and Social Psychology, 69 (5), 797. Villegas, A. & Lucas, T.F. (2004). Diversifying the teacher workforce: A retrospective and prospective analysis. Yearbook of the National Society for the Study of Education, 103 (1), 70-104. Citation: Goldhaber, D., Theobald, R., & Tien, C. (2019). Why we need a diverse teacher workforce. Phi Delta Kappan, 100 (5), 25-30. DAN GOLDHABER (dgoldhaber@air.org) is director of the Center for Education Data and Research (CEDR) and the National Center for Analysis of Longitudinal Data in Education Research (CALDER) and vice president of the American Institutes of Research (AIR). RODDY THEOBALD (rtheobald@air.org) is a senior researcher at the National Center for Analysis of Longitudinal Data in Education Research (CALDER) and vice president of the American Institutes of Research (AIR). CHRISTOPHER TIEN (cdtien@uw.edu) is a research analyst at the Center for Education Data and Research (CEDR) at the University of Washington, Seattle.